A budding Chinese e-commerce giant, a Canadian cannabis grower, and an early-stage uranium miner could offer jaw-dropping gains. Amazon.com (NASDAQ:AMZN) has achieved stunning returns for early stockholders, climbing from less than $2 per share shortly after its 1997 IPO to nearly $2,000 per share as of this writing. And even if you had bought shares of the e-commerce juggernaut a mere five years ago, you still would have seen the value of your investment climb more than 600%. Of course, the reasons for Amazon's astronomical rise are clear in hindsight. But are there any other stocks on the market today that could put Amazon's returns to shame? We asked three top Motley Fool contributors to weigh in to that end. Read on to learn why they like JD.com (NASDAQ:JD), OrganiGram (NASDAQOTH:OGRMF), and Denison Mines (NYSEMKT:DNN). Consider this "Amazon of China"
Steve Symington (JD.com): Chinese e-commerce leader JD.com, the so-called "Amazon of China," is a $46 billion business as measured by market capitalization, as of this writing. But it's dwarfed by the $942 billion juggernaut Amazon has become. So how can JD.com potentially rival the size -- and, most importantly, the shareholder value-creating ability -- of its American counterpart? While its biggest rival, Alibaba, serves as more of an online marketplace like eBay, JD.com delivers products purchased through its JD Mall platform directly to Chinese consumers. And JD is forsaking bottom-line profits in favor of investing heavily in its logistics, warehousing, and delivery infrastructure to build a sustainable Amazon-esque advantage in the Middle Kingdom. Better yet, shares of JD have fallen nearly 40% from their 52-week high set in January, most recently pulling back amid economic tensions and trade war concerns between the U.S. and China. JD's long-term story remains firmly intact, however, and I think the stock could easily trounce Amazon's returns for patient investors who buy now. Sean Williams (OrganiGram Holdings): Trying to top Amazon is a very difficult task, considering just how much cash flow the king of e-commerce can generate. But if any industry has a shot, it's marijuana. The company that I believe could wow investors in the years to come is Atlantic-based grower OrganiGram Holdings. Back in July, I had the pleasure of conducting an email interview with the CEO of OrganiGram Holdings, Greg Engel. And while I was already a fan of what the company was doing, relative to its cannabis peers, I felt even more positive about its future following some of his explanations and answers. In particular, I don't believe there's a marijuana grower that's using its growing capacity more efficiently than OrganiGram. The company has a three-tiered growing system that it estimates will yield 113,000 kilograms of cannabis-equivalent product despite only 490,000 square feet of growing space at its Moncton, New Brunswick, facility. Meanwhile, I can think of other grow sites that have in excess of 1 million square feet of growing capacity and are up to 30,000 kilograms lighter in expected annual yield than OrganiGram. That leads to the next point: location. The company has chosen to expand its capacity entirely at Moncton. Though OrganiGram is sort of forgotten, given its Atlantic-based roots -- most growers are located in British Columbia and Ontario -- its single site helps the company centralize and lower its costs. That should give it a genuine shot at some of the lowest per-gram grow costs in the entire industry. Investors will also appreciate OrganiGram's focus on alternative cannabis products, such as cannabis oil. Though most folks are paying attention to dried cannabis production, its higher-margin oils, which Engel expects will comprise half of all medical marijuana sales, could be crucial in jump-starting the company's operating margins. Even though OrganiGram won't be up to peak production until the second half of 2020, I expect this company to turn heads and surprise a lot of people. Reuben Gregg Brewer (Denison Mines): Compared with Amazon, Denison Mines, with its $270 million market cap, is an afterthought of a company. Its main asset, the Wheeler River uranium project, is a mine that isn't even built yet. In fact, it's only just entering the pre-feasibility stage, meaning it's still largely on the drawing board and awaiting more approvals. But it could be a very big mine when it's ready, ranking in the top five globally. And while uranium prices are low today, that's a good thing for Denison and its investors, since the stock can be bought for around $0.50 a share. That limits the downside to, literally, 50 pennies. And the upside could be huge. That's because today's oversupplied uranium market looks set to flip to being undersupplied in just a few years, as the 57 nuclear power projects under development today get completed. Supporting this outlook are production curtailments at some of the largest uranium miners in the world, in an effort to balance current supply with current demand, Cameco included. So Denison could end up with a mine opening right when prices are heading higher. The last time uranium prices were peaking, meanwhile, Denison's stock was up over $12 a share. If the miner's stock price follows that path again, the upside here could be huge. And with no debt on the balance sheet, it seems well positioned to make it through the costly construction process. For more aggressive investors, Denison is a low-cost option on higher uranium prices. It might seem Amazon has set the bar impossibly high, and nobody can know for sure whether these three stocks will go on to jump over it. But between JD.com's Amazon-esque position in China, OrganiGram's efficiency and focus on alternative cannabis products, and the potential for Denison Mines to benefit as uranium prices rise, we think chances are high that they could do just that. 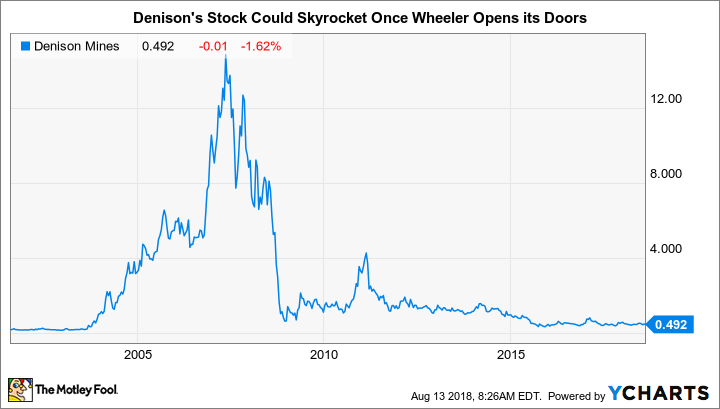 Is Denison Mines a Buy?